Lorrie Fredette is an installation artist and worker in the arts. Her site-specific investigations examine beauty, harmony and comfort to comprehend the incomprehensible of infection, pandemic and plague. Her pieces have been exhibited nationally and internationally including solo and group exhibitions in the U.S. and Europe. Exhibitions venues include Art Southampton (Southampton, NY), Seton Hall University (South Orange, NJ), Bank of America Headquarters (Charlotte, NC), Mass MoCA (North Adams, MA), Cape Cod Museum of Art (Dennis, MA) and Jyväskylä Art Museum (Jyväskylä, Finland). 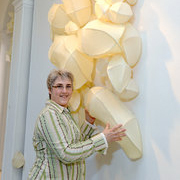 Lorrie holds a BFA in sculpture from the Herron School of Art at Indiana University. Cynthia-Reeves in New York represent her work.